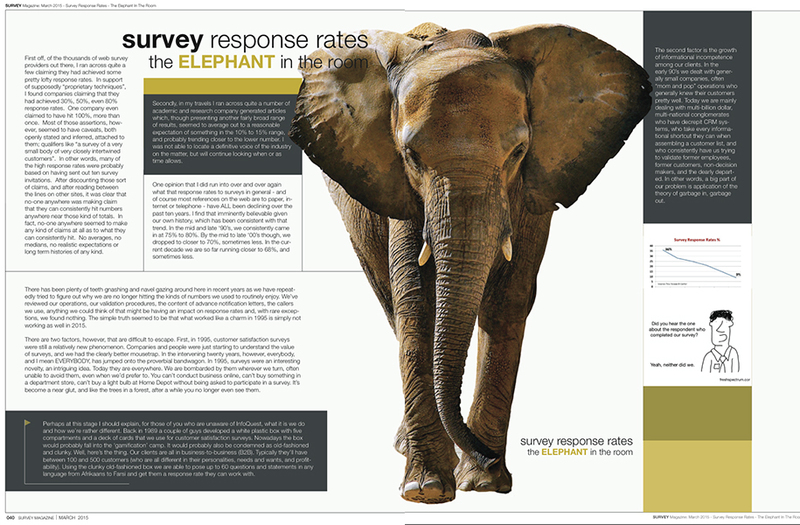 Over the past couple days I’ve been researching the general subject of Survey Response Rates. My normal interest in the subject became elevated when I ran across an article having to do with the ACSI (or American Customer Satisfaction Index). First off, of the thousands of web survey providers out there, I ran across quite a few claiming they had achieved some pretty lofty response rates. In support of supposedly “proprietary techniques”, I found companies claiming that they had achieved 30%, 50%, even 80% response rates. One company even claimed to have hit 100%, more than once. Most of those assertions, however, seemed to have caveats, both openly stated and inferred, attached to them; qualifiers like “a survey of a very small body of very closely intertwined customers”. Low response rates is always a problem for survey practitioners. However, there are a number of things you can do to improve response rates to your online survey. 1. Contacting your audience. You need to use different approaches including, email, blog posts of the forthcoming survey. You will also need to think about the different outlet channels your particular audience has access to. Letting your potential audience know in advance can raise interest and the arrival of the survey does not come as a surprise. 2. Personalise your survey invite. If you can personalise your invite email this can result in a 4%-5% increase in survey returns. 3. Keep your invitation email short. First the email must look professional and you will to provide some information about the survey, how the person was selected, what are the benefits of the survey including benefits for the respondent, approximate time to complete, confidentiality and a contact name if the respondent wants to check anything out. This should be followed by a simple link to the survey and a Thank you. 4.Use a welcome screen that is motivating. The welcome screen needs to emphasise the ease of responding, and shows respondents how to move to the next page. The page should also include details about how the information will be used, whether it’s confidential or will be shared or anonymised. 5. Ensure the first question is easy to understand. There is evidence that the first question on the screen can have a significant impact on whether the respondent continues to complete the questionnaire or not. So make it’s easy to answer and does not ask for sensitive or embarrassing information. Also make sure it applies to all your audience and is not a filtering question. 6. Avoid multi question screens. Keep to one question a screen as this enables the respondent to focus on one thing and avoids the respondent having to scroll. Having one question per screen also enable efficient use of instructions question and skip logic. 7. Avoid the over use of graphics. Graphics and internet features can distract from the content and purpose of the survey. Keep things simple. 9. Send email reminders. Some respondents respond by return and hopefully, your survey returns will rise as time passes however, if your returns are flat lining or there’s a point at which you see a decline in responses, this is the time you will need to send a reminder email. This is usually around two weeks. The email should include a summary of the first email, including benefits and confidentiality. If you have have had a good response this can also be pointed out. Also stress that everyone’s responses are important to the survey. How many reminders should you sent? Probably two reminders, as evidence shows there is little increase with more than two. Take time in writing both the first and reminder emails as theses can significantly impact on response rates. Also make sure you are not sending reminders to those who have already responded or declined or do not wish to be contacted. 10. Promise to publish your survey results. It’s often the case that respondents contribute to a survey and hear little more afterwards. With the increasing amount of online surveys, potential respondent are more and more reluctant to participate, unless they see some value in the survey either for themselves or others. It’s also unprofessional to expect someone to give 20 minutes or so of their time not to receive any feedback what so ever – even a “thank you.” For all we know our unprofessional behaviour can have – most likely – consequences on other researchers conducting survey research. Three approaches can help to address this. The first, is to send a thank you to all respondents. Depending on the nature and confidentiality of your survey this can be combined with a general summary which simply reports the key findings without complicated scientific jargon and statistics. You can also have a section at the back of the survey which asks respondents to comment on the survey and or add additional information. If you find our posts interesting why not link up to our blog through the RSS feed so you get our postings as they are published. If you would like more information about how we can help you in the design of your survey questionnaire please contact by completing the contact form below.